On uploading the theme of “Yu-Gi-Oh!,” Sean Hogan won 15,000 views a day. This fact motivated me a lot, on top of my some interest in the animation series I’ve never watched seriously. The introduction talk is tooooo long! The music itself starts from 5:28. This composition might be the creator’s “taste.” “We are not just eyeing the number of customers. Remember, we are selling our “taste,” said legendary ramen master Minoru Sano. (See “OPNo.22 “Remember, We Are Selling Our Taste”) However, Sean should a bit more care about non-native-English audiences who represent a majority of YouTube users, including me. We cannot enjoy as much as you when we have to listen to lengthy English speaking introduction full of jokes. We’d like to listen to your music more. I ask you this because I love your music very much, Sean. I will leave this comment at your channel later. The music arrange is actually superb. Mysterious melody and exotic sounds created with very common, everyday tools, pianica, metal bowl and a screwdriver. This gap is killing. Ten years have passed since “Yu-Gi-Oh!? Noooo, it’s 20 year anniversary this year! During the long history of the series, a number of theme songs have been released and I’m not sure which one the Sean Hogan’s tune is based on. So, listen to the marvelous comment by a specialist. When you go back to the theme song video, you can confirm a number of scenes, from a fight against Shaadi, appearance of Pegasus and Ryo Bakura, a fight against Mariku in the Battle City tournament and Ryuji Otogiri in D.D.D. to three god cards and six priests in Pharaoh's Memories. 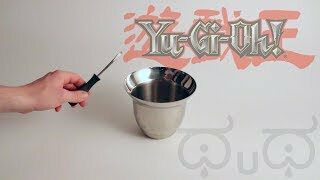 I accordingly interpret the video as the theme song for the opening part or something for the overseas version of “Yu-Gi-Oh!” What do you think of this view? Answer: “Yu Gi Oh Full Theme Song (English)” is the theme song for the opening part or something for the overseas version of Yu-Gi-Oh, isn’t it? I'm most grateful to the President of the Wan-nyan Group for his elaborative commentary including the difference between Japan and overseas on handling of tv programs for children. Was anyone else frustrated by the fact that no one seemed to notice that he grew a foot and a half whenever he did this? Could you elaborate this, President? 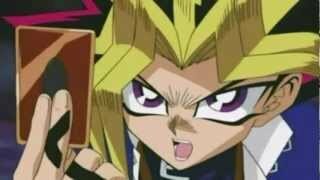 When the pharaoh descends to the body of intellectual Yugi Muto, this can be called the strongest status, I believe. This awakening of Yugi and Yami-Yugi brings about the dramatic change in the body shape of Yugi. 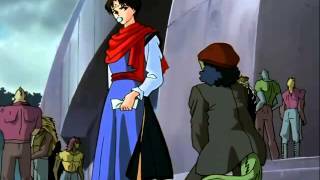 If you say this in another animation work, you will think of Koenma in “Yuyuhakusyo.” Normally, Koenma has the appearance of a child, but when he comes to the human world, he changes to the appearance of a young man. If you take consideration of such a change, the variation in expression would have no limits. 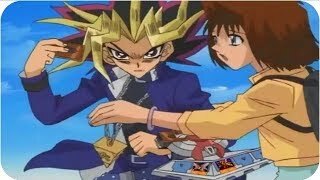 Answer: The awakening of Yugi and Yami-Yugi is as the same as the change of Koenma in “Yuyuhakusho”, I believe. I started to have an interest in “Yu-Gi-Oh!,” when I checked “Zutto ore no turn! !” the other day. I felt fear and, at the same time, got intrigued by the darkness of the protagonist who relentlessly keeps attacking Insector Haga. That’s a complicated feeling. On “infinite combo,” I will give this advice based on my personal views. According to Yugioh, the concept of “infinite combo” is “Zutto ore no turn!! or "My turn forever!!" (Berserker Soul), which frightens Insector Haga so badly. “Infinite combo” will turn to be Bishamon and just a hamewaza (a kind of chaet) in the end. I mean, it is the thought of emptiness. Thank you for your reading to the end!